The 86th Annual Macy’s Thanksgiving Day Parade will begin on Thursday, November 22, 2012, at 9 a.m. The parade travels down Central Park West from 77th Street to Columbus Circle along Central Park South to 6th Avenue, down 6th Avenue to 34th Street and along 34th Street to Macy’s Herald Square (34th Street). 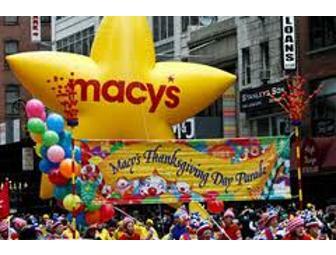 There will be a new parade route for 2012, but the Macy’s Thanksgiving Day Parade will still begin at 77th Street & Central Park West and end at Macy’s Herald Square. In order to get a good viewing spot, many people arrive before 6:30 a.m. the morning of the parade to stake out space along the Macy’s Thanksgiving Day Parade route. Be sure to wear plenty of warm clothes and bring a thermos full of coffee or hot cocoa, as it can be quite cold. The duration of the parade depends on where you view it from – near the beginning of the route, it will last about 1 1/2 hours, closer to Macy’s, the parade will last closer to 3 hours. You can also book a hotel room with a view of the Thanksgiving Day Parade. For meeker, the parade will be aired on NBC from 9 a.m. until noon. If you’d like to get a chance to see the balloons as they get blown up, on Wednesday, November 21, 2012 you can watch the inflation of the 25 parade balloons from 3 – 10 p.m. near the American Museum of Natural History just off Central Park West between 77th St. and 81st St.
How to airbrush away all your wrinkles. Smart cosmetics that use tricks of the light to hide your flaws.